www.photomacrography.net :: View topic - Total Magnification with DSLR and Trinocular Microscope ? Total Magnification with DSLR and Trinocular Microscope ? Posted: Wed Oct 16, 2013 7:14 pm Post subject: Total Magnification with DSLR and Trinocular Microscope ? Any Help would be appreciated, Thanks in Advance ! Bcgeo, welcome to the forum! Direct measurement, such as you have done here, is a really good way to determine magnification on sensor. In this instance, we are seeing slightly over 11mm of the ruler. (So we can say that the horizontal "field of view" or "subject field" is about 11mm.) Your camera has a 23.6mm horizontal width. So your magnification on sensor is slightly over 2x (which can also be written as 2:1). Where M=magnification on sensor; S=sensor size, and F=field of view. Chris and I were typing at the same time, so some of this post will duplicate what he has already said. However, I want to cover some other points too, and it's best to do them all together. First, thank you for posting a picture showing a mm scale. This makes our life much simpler. Now, notice that the image width spans almost exactly 11.0 mm on the ruler. Because your sensor width is 23.6 mm, it is simple to calculate the overall optical magnification as 23.6/11.0 = 2.15X (rounded to 3 significant digits). If we had done a standard calculation based on specifications of the optics, we would have just multiplied the microscope setting of 1x times the coupler spec of 2.5x, and gotten the result "2.5X". I put this in quotes to emphasize that this calculation gives the wrong answer. The problem in this case is not that the calculation is wrong, but the numbers going into it are. Undoubtedly the microscope is not exactly 1X, or the coupler is not exactly 2.5X, or both. 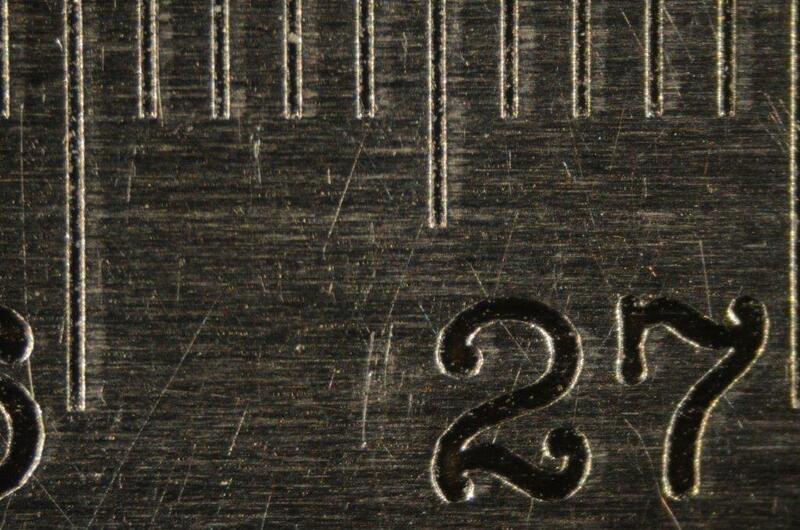 In contrast, simply taking a picture of the ruler quickly gives the combined magnification, and there's very little to go wrong with that process. Now, notice that I was careful to say "optical magnification". That refers to what the lenses do in projecting an image of the subject onto your sensor. If you're making prints, then you might also be interested in knowing magnification onto the print. This follows the same pattern as for optical magnification, except using the print size instead of the sensor size. For example if you print this image 250 mm wide (just under 10"), then the overall magnification will be 250/11 = 22.7X . If the image is to be displayed on an electronic monitor, then determining overall magnification becomes troublesome. With any one monitor, it's simple enough to measure the image size on the monitor, divide by the field width of 11.0 mm, and get the overall magnification. For example, on the monitor in front of me right now, that would be 289 mm divided by 11.0 mm = 26.3X. However, when I display exactly that same electronic image on my laptop, then suddenly it becomes only 18.4X (202 mm wide). Shown on my largescreen TV, it might become 60X. There's a moral here: "Do not try to specify overall magnification for an electronic image." There are other issues to think about. The big ones are "Why do you want to know the magnification? What are you going to do with the number?" If you personally want to know the optical magnification, from subject onto sensor, then the calculation we've discussed will work fine. But if you need to communicate magnification to other people, then you need to think about what will be meaningful to them. That will vary depending on the audience and the application. Here at photomacrography.net, it's probably OK to say something like "Nikon D7000 at 2.15X". However, exactly the same picture could have been taken with a "Nikon D800 at 3.27X" or with an "Olympus E-P5 at 1.57X". So it's not enough to tell the reader what the optical magnification is. You also need to specify the sensor size. If you crop your image, that has to be factored in also. In the end, depending on your goals, it might be better to ignore "magnification" and instead specify the frame width -- 11 mm in this case. If the reader cares about magnification, they can always figure that out for themselves.